The Kansas City Royals head to Progressive Field on Saturday, September 16, 2017 to take on the Cleveland Indians. The expected starting pitchers are Jason Hammel for the Royals and Carlos Carrasco for the Indians. The odds for this matchup have Kansas City at +237 and Cleveland at -260. The Royals have a 69-71-6 over/under mark and a 69-77-0 run line record. The Indians are 74-73-0 against the run line and have a 55-82-10 over/under record. The Royals have a 72-74 overall record this season. Starting pitcher Jason Hammel has a 8-11 record with an earned run average of 4.91 and a WHIP of 1.39. He has 132 strikeouts over his 165 innings pitched and he's given up 184 hits. He allows 10 hits per 9 innings and he has a FIP of 4.41. The bullpen has an earned run average of 4.33 and they have given up 506 base hits on the year. Teams are hitting .252 against the bullpen and they've struck out 458 hitters and walked 222 batters. As a team, Kansas City allows 9.3 hits per nine innings while striking out 7.6 batters per nine innings. They are 18th in the league in team earned run average at 4.61. The Royals pitchers collectively have given up 1,345 base hits and 666 earned runs. They have allowed 179 home runs this season, ranking them 16th in the league. Kansas City as a pitching staff has walked 468 batters and struck out 1,098. They have walked 3.2 men per 9 innings while striking out 7.6 per 9. They have a team WHIP of 1.40 and their FIP as a unit is 4.45. As a team Kansas City is hitting .260, good for 10th in the league. The Royals hold a .421 team slugging percentage and an on-base percentage of .312, which is good for 28th in baseball. They rank 12th in MLB with 8.9 hits per game. Eric Hosmer is hitting .325 with an on-base percentage of .393. He has 178 hits this season in 547 at bats with 86 runs batted in. He has a slugging percentage of .514 and an OPS+ of 137. Lorenzo Cain is hitting .299 this year and he has an on-base percentage of .361. He has totaled 160 hits and he has driven in 47 men in 535 at bats. His OPS+ is 111 while his slugging percentage is at .443. The Royals have 1,298 hits, including 232 doubles and 176 home runs. Kansas City has walked 354 times so far this season and they have struck out 1,048 times as a unit. They have left 912 men on base and have a team OPS of .733. They score 4.37 runs per contest and have scored a total of 638 runs this year. Cleveland has a 91-56 overall mark this year. With an earned run average of 3.41, Carlos Carrasco has a 15-6 record and a 1.08 WHIP. He has 201 strikeouts over the 179.1 innings he's pitched. He's also given up 153 hits. He allows 7.7 hits per nine innings and his FIP stands at 3.22. The bullpen has an earned run average of 2.78 and they have given up 366 base hits on the year. Teams are hitting .222 against the Indians bullpen. Their relievers have struck out 487 batters and walked 135 opposing hitters. As a team, Cleveland allows 7.9 hits per nine innings while striking out 10 batters per nine innings. They are 1st in the league in team earned run average at 3.35. The Indians pitchers as a team have surrendered 1,146 base knocks and 487 earned runs this season. They have given up 149 home runs this year, which ranks 30th in Major League Baseball. Cleveland as a staff has walked 376 hitters and struck out 1,454 batters. They give up a walk 2.6 times per 9 innings while they strike out 10 per 9. Their team WHIP is 1.17 while their FIP as a staff is 3.38. As a team, they are batting .264, good for 6th in the league. The Indians hold a .451 team slugging percentage and an on-base percentage of .340, which is good for 2nd in baseball. They rank 9th in MLB with 9.0 hits per contest. Edwin Encarnacion comes into this matchup batting .252 with an OBP of .376. He has 128 hits this year along with 89 RBI in 507 AB's. He maintains a slugging percentage of .491 with an OPS+ of 122. 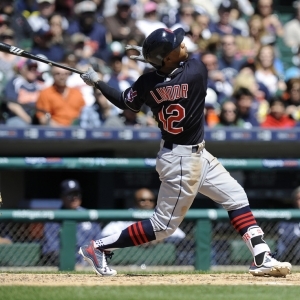 Francisco Lindor is hitting .277 this season and he has an OBP of .336. He has collected 164 hits in 593 at bats while driving in 79 runs. He has an OPS+ of 114 and a slugging percentage of .506. The Indians as a unit have 1,321 base hits, including 303 doubles and 193 homers. Cleveland has walked 558 times this year and they have struck out on 1,058 occasions. They have had 1,060 men left on base and have an OPS of .791. They have scored 5.05 runs per game and totaled 743 runs this season.